Someone Has Cast Bread upon the Waters, and Look How It Has Helped! Ruth Tracey, 23, had been a long-time shoplifter. On her last night in jail she gave me a remarkable letter (reproduced below) that shows how timely it was for her to receive instruction and encouragement in the Primary Series of Ashtanga Yoga. Enthusiastic and grateful for being introduced to a happy way of life that actively discourages pretentiousness and promotes integrity, Ruth has been practicing daily since her September 5th release, and has memorized the full Primary Series. Thank you to the anonymous donor, to The Community Foundation and to my inspiring friend, the scholar and yoga master Eddie Stern, for your meaningful support of my efforts. I’m very fortunate to be able to offer people their own specific daily practice of moving meditation synchronized with conscious, controlled breathing -- a practice of love, respect, gratitude, patience, and profound physical healing. With the inception of the non-competitive, anonymously funded grant last September, I added two classes per week for the ladies of the Richmond City Jail, to the two men's classes I was already teaching. This joint effort between the donor, TCF, Eddie Stern and the Broome Street Temple board, has been helping me reach twice as many inmates with the same daily practice that has been enormously beneficial to me since I began learning it in 2001 -- and I am deeply grateful that the six-month, $12,500 grant supporting my teaching has been renewed for a third period. In jail, Ruth Tracey exuded an air of graceful, understated good humor -- never loud, and always the most attentive student. Everyone liked her, even though she never joined in the choir of resistance and disruption that is occasionally offered by the ladies. Influenced by Ruth's simple example, one of the most immaturely resistant young girls in the class has become -- in Ruth's absence-- one of the new class lynchpins. I was surprised and moved when I read Ruth's letter, because it's unusual to see such thoughtful and engaging writing from a young inmate who has no formal education beyond high school. She hasn't attended university, but writes like a 23-year old with an English degree. In the last 25 days we’ve practiced together three times, and I’ve watched her through the practice once. I am thankful that the grant directly funds my thoroughly enjoyable teaching, and also that it indirectly makes it feasible for me to spend extra time, expense and effort staying connected to some of the better students who leave jail and still want to practice but have neither the money nor the confidence to head straight to a yoga studio. Absent the awesome support of this grant, I would likely have missed the opportunity to meet such a special person as Ruth at a critical time in her life. Sometimes I have excellent students in jail who upon release promptly resume the lifestyle that brought them to jail in the first place. Over the last month, I have seen that Ruth is different. She's been honest and reliable, has donated items she had obtained through theft to charity, and has begun making restitution, sending weekly sums anonymously to the stores where she had stolen books. She has a healthy spiritual thirst and is currently reading Edwin Bryant’s translation of the Yoga Sutras. In August, I received an unrequested, non-competitive $5,000 grant from Eddie Stern's Broome Street Temple, funded by the Libby and Lloyd Ann Charitable Fund of The Community Foundation Serving Richmond and Central Virginia. This money was awarded in connection with the successful state of the Richmond City Jail yoga program, as an incentive to expand my efforts. Thank you very much, Libby and Lloyd Ann -- whoever you are! This is proving to be critical seed money in initiating my dream of opening a practice space downtown where I will invite the approximately 700 folks I've taught over the last five and a half years in jail, to come back to class and resume their practices -- and encourage them to bring their families, friends, and neighbors to come practice with them at low cost. The main focus of the new space will be conveying the Primary Series in a way that anyone who desires can learn and practice it independently or in community with others -- regardless of his or her fitness level, destructive habits or station in life. My hope is that over time the space will become a cultural melting pot that is also patronized by MCV students and faculty, Sheriff Department employees, college students, and whomever else wants to come. Ruth Tracey has offered to help me with whatever chores she can in connection with my endeavor, and I look forward to seeing her grow. I believe she is embarking on a very bright future of being a healing presence in the world. To see Ruth's handwritten letter, click here for part one, and click here for part two. I remember myself as a child between 4-6 years old always playing on the floor, putting myself in full lotus lifting myself off the ground swinging back and forth like an old country porch swing, attempting to walk around on my hands. Back then I had no knowledge of yoga, its uses or benefits. I was just a kid exploring my body’s flexibility, trying to make myself and my family laugh to escape the pressures of early childhood trauma. As I grew older and learned how to read, I took refuge in books, immersing myself in their stories so I wouldn’t have to face my reality, reading all day, and if it was a good book, all night, becoming a real introvert. The days of experimenting with the limits of my body’s flexibility were over. By the time I was 17 I became interested in yoga again. By then I was already a criminal, though I hadn’t been caught yet. I feel ashamed, yet oddly get a sense of freedom admitting that I stole books -- among other things my parents couldn’t or wouldn’t buy me --books on various religions and spiritual systems, languages, yoga and philosophy. Paradoxical, yes, very. I was excited about yoga, but my interest in it was very superficial -- focusing solely on the positions, completely underestimating the importance of or downright ignoring the breathwork and meditation aspects of the practice. Then it became something I only did when I was bored-- hardly a healthy practice. So it’s no surprise that I eventually stopped practicing altogether. Through the years that followed my interest in yoga waxed and waned, but I started doing a deeper reading on the subject. I was at a time in life where I was believing in all these philosophies, but practicing very few -- living life as a hypocrite. When I read that one of the 8 limbs [includes] non-stealing, I stopped “practicing” again feeling guilty because I was still addicted to stealing. After my last run in with the law, I finally made the conscious decision to change my life and start acting on what I said I believed, to start making things right the best I could both for the sake of my future and for the world around me. I knew I could accomplish great things, but not if I kept wasting my life and potential trying to cheat the energetic economy. Over the course of the last four months, I made it my personal mission to start taking the steps towards becoming a healthy, whole being -- and seeing it through to fruition. I dutied myself to becoming diligent in prayer, which has helped me really believe I have received forgiveness, helped me forgive myself and feel set free from all the guilt and unexpressed emotions I had stored inside the recesses of my soul. When I was transferred to Richmond City Jail and was made aware that yoga classes were being offered, I jumped at the opportunity. This was the first time ever practicing under the guidance of a teacher instead of just trying to teach myself from a book. Rob is an excellent teacher. Being in his presence you feel a light, airy energy emanating from him and it is obvious that he is deeply seated in peace. It’s inspiring, making you want to cultivate that level of tranquility within yourself. He makes practicing yoga possible for anyone regardless of their level of flexibility, and gives personalized attention to advancing the practice of everyone in the class, gently pushing you to reach new thresholds you never knew you were capable of achieving. Yoga and meditation have improved the quality of my life in multiple ways. Most importantly, I am learning to breathe during challenging circumstances, constructively assess my thoughts and emotions so as to use logic in handling real world situations. Making time and space in my life to practice daily, mustering the drive to do it even when I’m not feeling up to it is teaching me self-discipline. As a result of dedicating myself to daily practice I have noticed an improvement in my digestion -- both of food and the events in my life, helping me to understand and accept them better. As my balance increases, so I am able to find my balance on the high beam of life mentally, emotionally, and spiritually. Yoga has helped me to become more patient, knowing that if I keep putting forth a daily effort my abilities will increase and I will be in a better state to accept what life has to offer me. Meditation has helped me to face the root causes of my emotional dis ease and realize that I was stealing material things trying to fill an emotional void, that it takes effort and dedication to self to heal emotional scars -- amassing material things will never make you feel “good enough” -- whether it is acquired by legitimate means or not -- if you don’t understand (and work to fix) the reasons for your feelings of inadequacy. I have started to become more mentally flexible, more tolerant, better able to “see” people’s energy and strengthen my own energy field so as to repel negativity from taking root and overgrowing in my mind. My experience has shown me that yoga is an extremely useful (I’d even go so far as to say necessary) tool in helping people in the jail/prison systems, mental institutions, those on the outskirts of society -- everyone really -- to become more whole beings, better mothers, fathers, brothers, sisters, neighbors, friends, citizens. It is especially useful in correctional institutions since the vast majority of the residents are products of an invisible negatively charged magnet a certain demographic calls the only life they’ve ever known. A perpetuation of feelings of despair, hopelessness, helplessness, pain, anger, resentment, and a whole host of negative attitudes about life passed from generation to generation creating their realities, keeping them moving in a downward spiral unable to evolve. Here the accessibility to yoga classes are most needed to help people learn how to connect to that stable center within themselves and make the necessary adjustments in viewpoints, outlook and character to completely change into better people for themselves and those around them. I truly believe everything happens for a reason. Though the events in my life have been undesirable, it has ultimately been for the elevation of my soul, so I give thanks. Yoga and meditation played a big role in my coming to that acknowledgement. If everyone looked at life this way -- especially some of the most troubled -- we will have made a huge first step towards the enhancement of our collective future. As I get ready to walk through the doors of freedom tomorrow morning, I feel much more prepared to face the world a new woman, take life by the horns, fulfill my (unlimited) potential, be more grateful for life and listen to the guide I’ve had within my whole life but always ignored. Thanks God. And thanks Rob for inspiring me to make my practice a daily ritual. The work you do is greatly appreciated and immeasurably important. Peace. 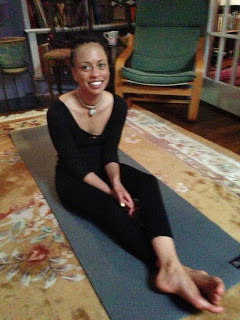 Prior to being published here, this blog was viewable richmondprivateyoga.blogspot.com. For that reason, comments made on BlogSpot are posted below. Please feel free to contribute to the conversation! What an inspiring and beautiful testimomy from this lovely young woman! I wish her much growth on her continuing journey. And I am grateful for Robbie's passion for and dedication to yoga and its principles both on and off the mat. May you, during your meditation question the existence of Christ the Lord and be led to someone who will share their journey in the power of the Holy Spirit why Christ Jesus is Lord and the atoning sacrifice for all sins and true, eternal peace within. I am honestly so lifted by your testimony. You have a faith and understanding brought to you by the highest power. I see your smile and I smile and it is heartwarming that you give thanks to God. Going through this hardship and finding peace in god is Godly training. I believe that you shall shine your light to those around you and encourage others. A true gift. We share the same name and I have also had a journey of pain and have been led to God's grace.